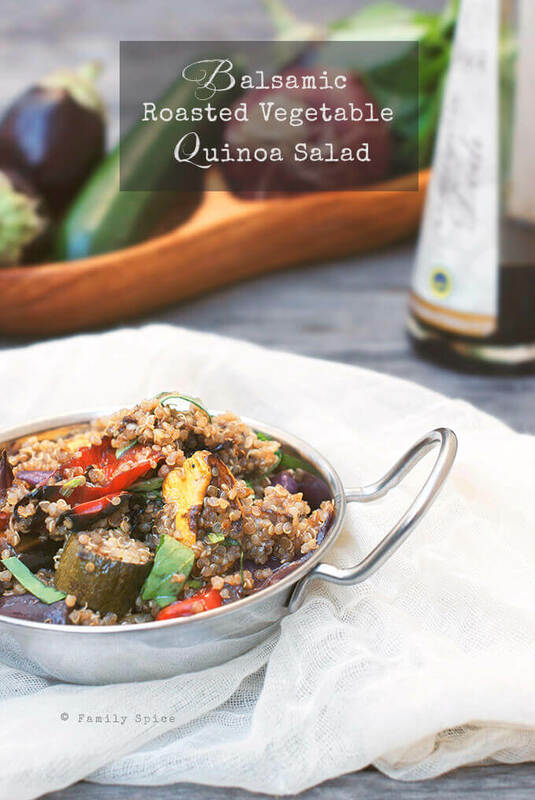 This Balsamic Roasted Vegetable Quinoa Salad is very forgiving, with the vegetables and dressing you use. You can easily customize this recipe to become your very own. I love to roast! It’s great for meats, it’s great for poultry and it’s better for vegetables!!! Roasting is one of the easiest cooking techniques, in my opinion. You basically heat your oven to the desired temperature and cook your food. Boom. That’s it. And when you have a house of picky eaters, having the meat and veggies separate makes dinner time more peaceful for all. The first time I made this Balsamic Roasted Vegetable Quinoa Salad was for my in-laws and I didn’t add quinoa to it. It was a BIG hit as an appetizer to serve with olives, artichoke hearts and crusty Italian bread. Since then, I have continued to make it and have adapted it with the addition of quinoa. Now this becomes a very delicious salad or side dish. It even makes a wonderful lunch or light meal. And it is ridiculously easy to make. 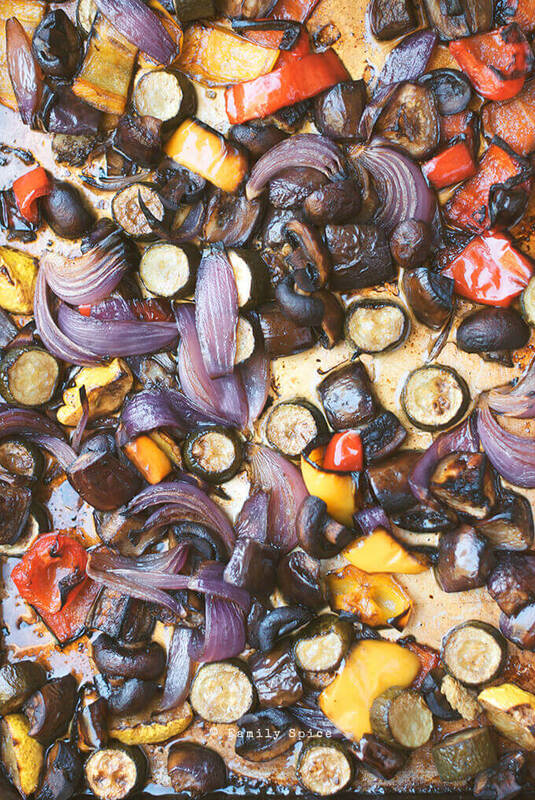 Eggplant, mushrooms, bell peppers, red onions… whatever vegetables you have on hand will do. The key is to cut the vegetables in equal sizes so they roast evenly. You don’t want a bowl full of mush, so don’t cut them too small. Toss them with extra virgin olive oil and balsamic vinegar and roast. The onions get caramelized, the squash and eggplant are tender and everything is bathed in the syrup of the balsamic vinegar. The beauty of this dish, is that you can serve it hot or cold, as a salad, side dish, light meal or appetizer. Toss it in some pasta, mix in quinoa, or add some shrimp or chicken and you have a hearty meal for those with big appetites. Coat well then place evenly in a large baking sheet. Make sure onions do not separate into single pieces. Keep them in large chunks. Leave any excess oil and vinegar in the bowl. Bake for 20 minutes. 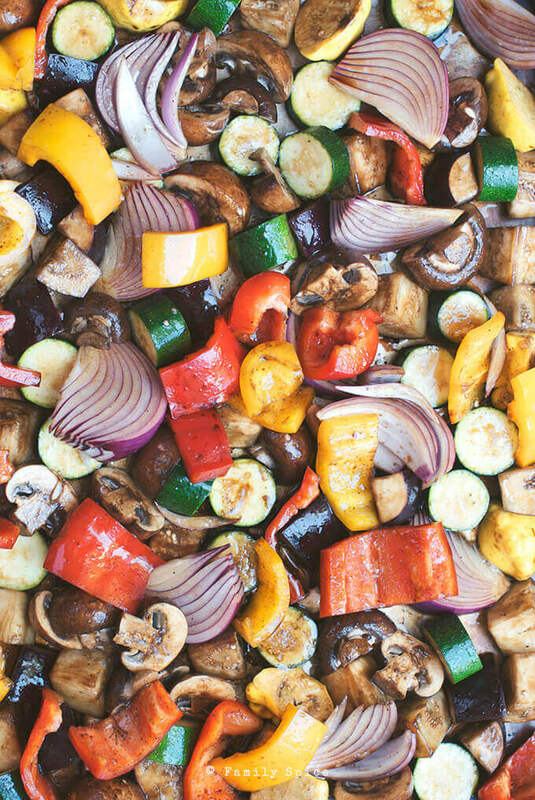 Stir the vegetables up and bake an additional 20 minutes or until vegetables are browned. When both the quinoa and vegetables are cooked, remove both from heat and allow to cool to room temperature, about 15 minutes. Combine both the quinoa and vegetables in the large bowl with the remaining oil and vinegar, if any. Serving Suggestions: Serve as a side dish or as an appetizer.